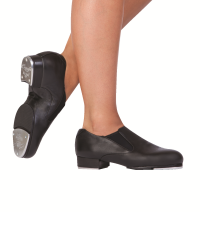 We carry jazz and tap shoes in many styles. Whether it's for recreational or professional dancing. And if we do not have the shoes you are looking for in our stores inventory or if you have special orders we are happy to order them for you. Capezio - Vary on cost and styles depending on level of instruction. Available is the K360 especially made for advanced and professional dancers. Bloch - In stock 3 styles including SO 301 M constructed for men only. All shoes are strong, soft leather. Special resonating sound board for clear sharp tones. Cushioned insole allowing comfort and shock absorption. Highest quality of taps included. Quality stage shoe, top grade man-made leather or leather upper. Available in 3 widths in 1 1/2 or 2 inch heel. Taps can be added if needed.